Here are some tips on how to keep your caravan kitchen well-maintained, practical and safe. Most RV enthusiasts take pride in being self-sufficient, so having a functional, well-ordered caravan kitchen during your trip is a must. Here’s a practical guide to maintaining your caravan’s kitchen, including safety checks and storage tips. Remember space is at a premium in your caravan kitchen, so while packing for your trip, consider what items are essential and what can be left behind. For instance, it’s unlikely that you’ll need to bring an entire set of saucepans, let alone a full set of mugs or cutlery. Bring more square containers with you as they waste less space than round ones. Also, try to use containers that match in size and stack inside one another, so you can store them efficiently when they are not being used. Resealable bags are also a great way to keep food fresh without taking up excess space. If you put on your thinking cap, you can probably find at least several ways to get more out of your kitchen space. If your pantry is the right width and you could use more shelves, consider adding wire pull-outs. They can also keep your items from moving around during transit. If the pantry door is strong enough, you might also be able to screw wire racks inside it for items such as cling wrap and spices. If you have spare storage elsewhere in the van (for example, under the bed or in overhead lockers), you can use it to stash long-life food and appliances you don’t use very often. Keep the gas bottle connection pointed away from the van. When you’ve arrived at your destination, check the gas bottle is secure and there aren’t any leaks. An easy way to check this is by splashing soapy water over the connections; if bubbles form, you’ve got a leak. A gas leak in an enclosed space can be deadly, so never use a gas cooker without some form of ventilation, such as an opening skylight. Before hitting the road, first make sure all loose items such as cutlery, plates and small appliances are safely stowed in drawers and cupboards. One sharp bump can overturn a knife block or detach items from a magnetic knife rack, so it’s important that all sharp implements are locked away in the drawer. Your mobile home might be sitting unused for many months, during which time moist air and lack of ventilation could allow mould and mildew to build up – leaving you with an unpleasant odour when you start preparing for your next trip. Before you set off, rid your caravan of microbial nasties by wiping down all surfaces with diluted disinfectant solution. It’s also a good idea to do this again immediately after your trip, to prevent any lurking mould or bacteria from recolonising your caravan. 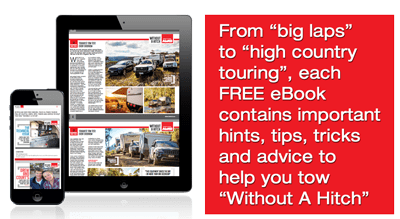 Also be sure to check out our complete guide to caravan maintenance, and our eight top tips for cleaning your caravan.